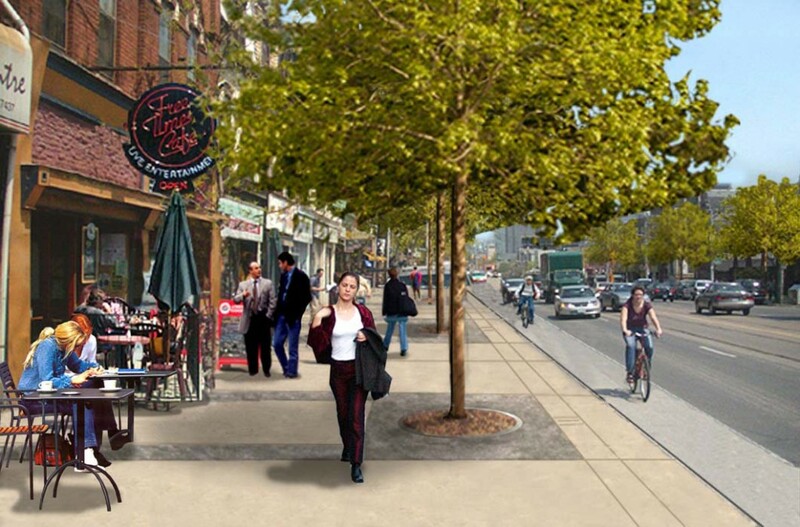 Titled “A Creative Landscape for Making a Living,” Brown+Storey Architects’ Master Plan for upgrading the pedestrian realm along a key stretch of Toronto’s College Street transformed a city plan for status quo replacement into a successful enhancement program. The plan, produced in 2000 for the Harbord Village Residents Association, shaped not only its study blocks, but a broader transformation of the city’s sense of what College Street was and could be. College Street, an east/west main street almost 1 km in length, runs across and mediates between a number of neighborhoods, businesses, and institutions within historic Toronto. The section of street under consideration was scheduled for reconstruction by the City of Toronto. 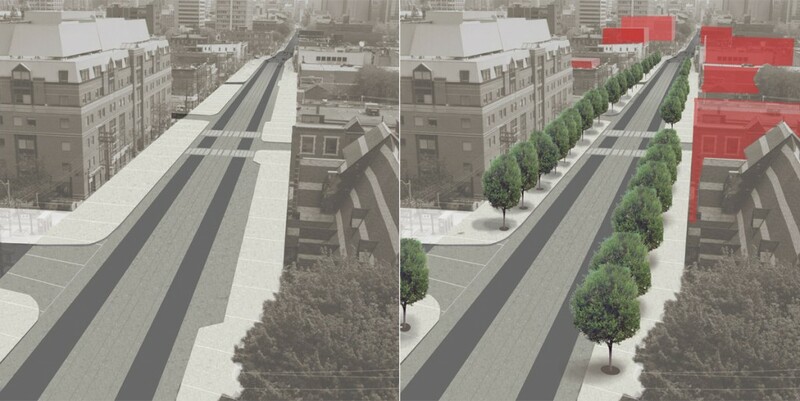 The proposed minimal improvements only added 13 new trees, and simply replaced old concrete with new concrete. A meeting with a local community group resulted in our office being hired to expand the possibilities for the street. This particular section of College Street was degraded and in a state of disrepair, with businesses suffering as a result. Despite the cultural diversity and local nature, it became obvious that any urban design improvements should significantly support the shopping quality of the street and improve its business ecology. A new plan was accepted by the community, comments were made and changes were implemented. Most noticeably, transportation and road capacities could still function adequately with the reduction of one lane of traffic. This expanded dimension, when applied to the north sidewalk, meant that an entirely new and more flexible space could be zoned. 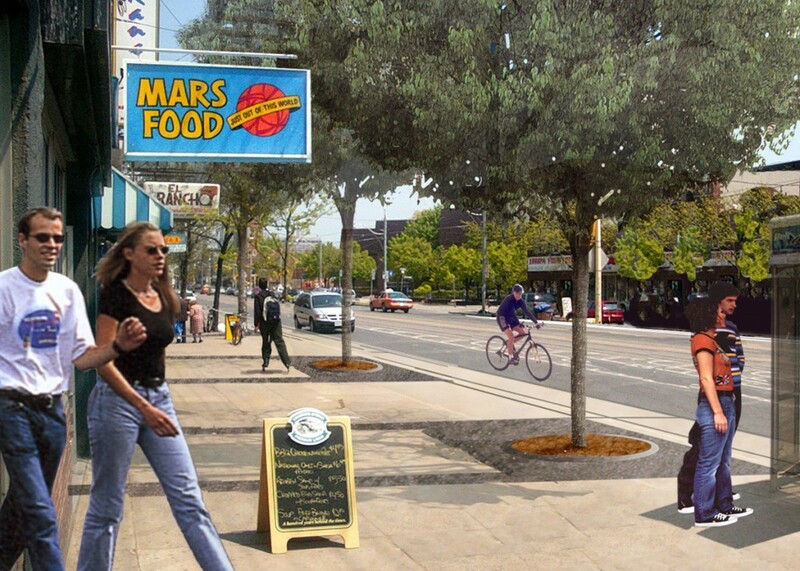 This zone would instigate an increased pedestrian walking zone, a controlled infrastructure zone for trees and bus stops, and a unique water collection system that utilizes the sidewalk as a rainwater source and distribution network. The increased width of sidewalk also allows for an entirely new line of trees to be planted free of utilities. This expanded new zone enables adjacent existing businesses to utilize and appropriate it. 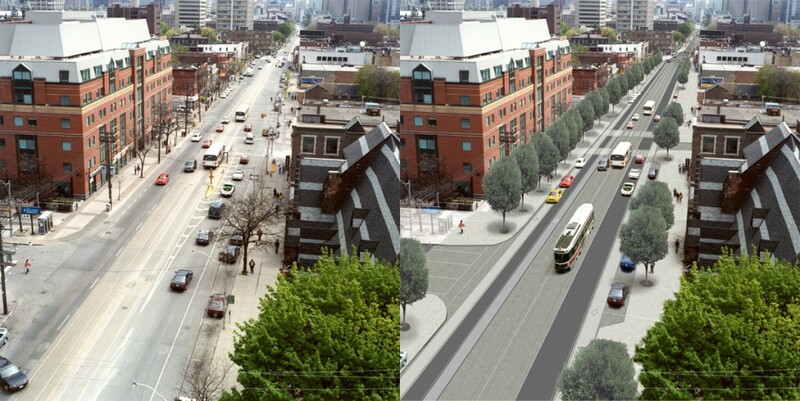 Other features of the plan include cycling lanes, integration with the TTC, the elimination of traffic islands, expanded parking, and improved crosswalks. A new proposed Square, dedicated to Al Waxman, would replace a current strip mall, and would mark a historic entrance into Kensington Market. At a more expanded City scale, extensions of this alternative plan for College Street formed the basis for conversations with the University of Toronto, and for the emergence of a new bio-medical district. The architects worked on the proposal for only a dollar because they wanted to help the community, which they live in as well, Brown told the Gleaner... Beautifying this area and expanding the sidewalk "could create new industry and growth possibilities for residents and businesses."